Kufa Makwavarara was born in Zimbabwe. 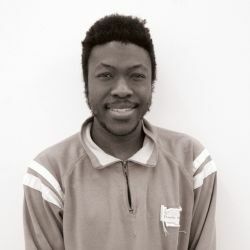 From 2001 to 2003 he studied at the National Gallery School of Visual Art and Design in Harare, Zimbabwe and currently lives and works in Cape Town, South Africa. 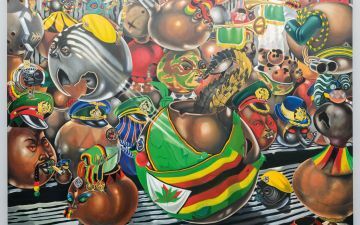 An avid gamer, Makwavarara’s paintings are satirical, providing commentary on the socio-political condition of Zimbabwe through the use of caricatures, paraphernalia, ‘traditional’ symbols, and iconography. In Pre-2018 Election: Zimbabwe Presidential Inauguration (2018) we see regimented rows of vessels balanced precariously on top of one another. They have anthropomorphic facial features and are decorated with military regalia: lapels, badges, and hats. Some play musical instruments typical of a political procession, and appear to be ‘dancing to the same old tune.’ In front of them, the tail of a crocodile (a symbol associated with Emmerson Mnangagwa) disappears into an open pot. The Zimbabwe Bird has been replaced with a marijuana leaf, referring to the way in which Mnangagwa frames himself — an ordinary, relatable man. Ceramic pots are part of Zimbabwe’s material culture. They are everyday items traditionally used in a domestic setting. The markings inscribed on them often have cultural significance. By transforming these pots into politicised caricatures, Makwavarara highlights the everyday impacts of politics on the country’s citizens. 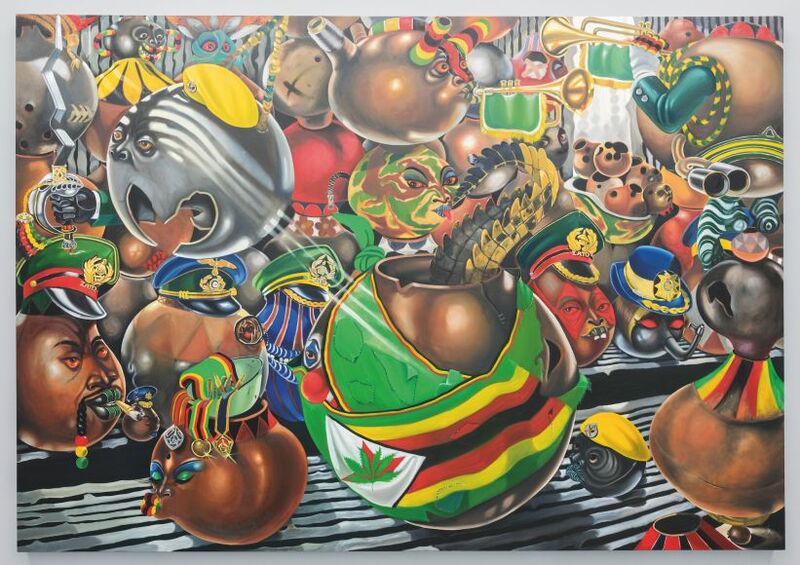 Makwavarara began exhibiting with Gallery Delta, Harare, in 2000, where he has been included in exhibitions such as From Sound To Form (2013) and Roots (2010). Other exhibitions include Frieze at RK Contemporary, Cape Town (South Africa: 2018); Dialogues at State of the Art Gallery, Cape Town (South Africa: 2017); and Emergence at Ebony Curated, Cape Town (South Africa: 2014-2015). Kufa Makwavarara works are featured in the Zeitz MOCAA exhibition, Five Bhobh – Painting at the End of an Era (2018 – 2019).